As a part of today’s Ohio Blogging Association‘s All State Blog Swap, I’m happy to introduce you to Stephanie from Hungry in CLE. On this day, bloggers from around the great state of Ohio are guest posting on one another blogs as a way to help to get one another in our blogging community. For a full listing of blog swap participants, please visit Poise in Parma today. Charlene and I both take full advantage of all Cleveland has to offer. We love cheering on our hometown teams, dining at wonderful restaurants, and attending events that celebrate our beautiful city. However, I recently realized there are things I make a point to do while traveling that I have neglected to do right here in Cleveland. As a lover of craft beer, visiting breweries in other cities always ends up in my plans. I always make a point to tour a new brewery when I visit my best friend, Amanda, in Colorado. Over Labor Day weekend, my boyfriend Brad and I took a road trip to Lakewood, New York, to visit Southern Tier. Even when I was in Detroit to run the Detroit Marathon, we stopped at Atwater Brewery and ended up taking part in Detroit Beer Week. 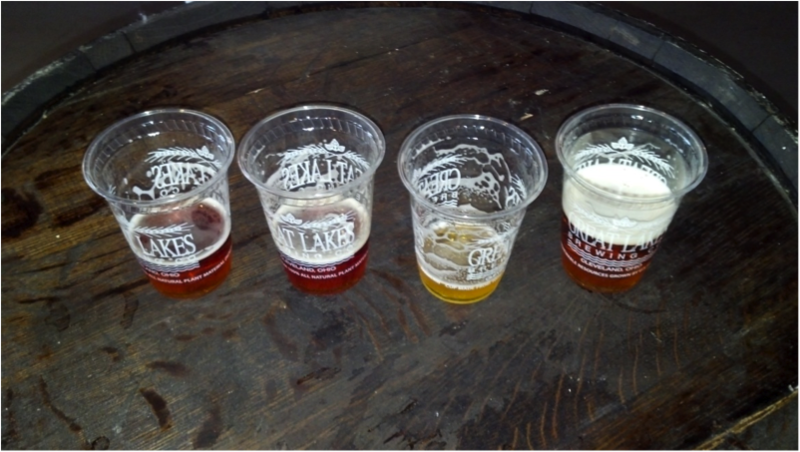 However, I have never been on a tour of Great Lakes Brewing Company until this past weekend. I have been to Great Lakes Brewing Company countless times for dinner or just to enjoy a few good, local brews. Brad and I often stop in to try the pub exclusive beers or Firkin Thursday, where one of their beers is aged with a slight twist, such as Edmund Fitzgerald aged with coffee beans. We went to the Christmas Ale release and have taken the Fatty Wagon to Tribe games. I have mentioned, on a few occasions, that I have never been on a tour of the brewery. So as part of my birthday present, we toured the Great Lakes brewery. Our tour began in the gift shop where we learned the history of the building that houses Great Lakes’ brewpub. Opened in the 1870s, the Market Tavern occupied this site until the Conway brothers opened Ohio’s first microbrewery in 1988. 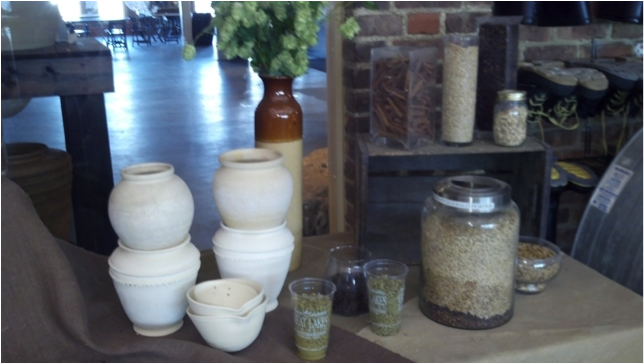 Across West 26th Street, at the brewery, we saw where hops, malt, barley, and water become beer. While we were there, they were brewing a fresh batch of Christmas Ale causing the room where the mash and wort are made to smell of cinnamon and nutmeg: 20 pounds of cinnamon, 20 pounds of nutmeg, and 60 pounds of honey warm the heart of thirsty Clevelanders. We then went to the tasting room and learned a bit more about some of the names of the beers. Dortmunder Gold was originally called Heisman Ale, since the birthplace of John Heisman is right around the corner on Bridge Avenue. However, the College Athletic Association of New York threatened to sue Great Lakes and the beer was renamed Dortmunder Gold. Each of their beers are named for some historical event or person in Cleveland, which is a wonderful tribute to the city as a whole. Next we saw the fermenters and bottling line. Any bottle that is not filled properly is used in the kitchen at the brewpub or in ice cream. Also, none of the beer served at the brewpub is kegged or bottled. It runs through lines under the street to into the brewpub ensuring the freshest beer served to you. It can be easy to overlook the “touristy” stops in your own back yard. I now want to tour other local establishments such as Jacobs Field, The Rock and Roll Hall of Fame, and a backstage tour of Playhouse Square. They can provide a better understanding and appreciation of your local favorites. Where are some local places you want to tour? This entry was posted in Uncategorized and tagged Beer in CLE, Blog Swap, Cleveland, OBA, The CLE. Bookmark the permalink. For as much as I hang out in Ohio City, I have to take this tour! Sounds like fun! Great idea! Last year, I got my father-in-law 2 tickets to the beer school at GLBC and he loved it. You just gave me a great idea for a very unique b-day present. Thanks! We took a few home-brewers on the GLBC tour when they visited us – they had such a great time. If you’re looking for other local tour ideas, the Take a Hike program is a lot of fun. Learned a lot about PlayhouseSquare district earlier this Fall.